Project to improve streetscape on West Main Street from JPA to Ridge/McIntire. It will include wider sidewalks, street trees, lighting and undergrounding of utilities. Funded portions will include $750,000 to match University of Virginia for portion from JPA to Roosevelt Brown Boulevard, and $300,000 to match developer for portion from Ridge to 4th Street. Kimley-Horn designing portion from JPA to Roosevelt Brown Boulevard. The city has paid nearly $2 million over multiple years to the firm Rhodeside & Harwell to create the plan. Their work continues at a time when West Main is experiencing rapid transformation. Council approved a concept in March 2016 after much study. they also readjusted the zoning on the street. As the study continued throughout the summer of 2014, representatives of churches such as First Baptist Church wanted their need for on-street parking to be considered. The process was slightly slowed down to make sure all stakeholders were heard. The preliminary cost estimate to implement the streetscape has been consistent around $30 million, though that number could change as the construction documents are finalized. A subset of the study was to look at the zoning of the street. The recommendation was made to convert the street's two zoning into western and eastern districts as opposed to south and north districts enacted during the 2003 rezoning. There are approximately 90 on-street parking spaces on the road between JPA and Ridge-McIntire. Dena Rhodeside identified the potential for as many as 4,000 new and existing parking spaces within 600 feet of West Main. ↑ 1.0 1.1 1.2 Web. Council breaks West Main Street plans into multiple phases, Sean Tubbs, News Article, Charlottesville Tomorrow, October 17, 2017, retrieved November 25, 2017. ↑ 2.0 2.1 Web. 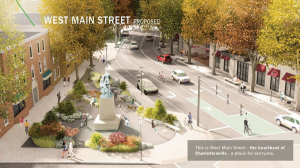 Council chooses path for West Main streetscape, partially approves rezoning, Sean Tubbs, News Article, Charlottesville Tomorrow, March 22, 2016, retrieved December 31, 2016. ↑ 3.0 3.1 Web. Charlottesville architecture panel gets peek at West Main schematics, Sean Tubbs, Charlottesville Tomorrow, October 10, 2016, retrieved October 17, 2016. ↑ Web. PLACE task force considers West Main and Belmont Bridge, Sean Tubbs, Charlottesville Tomorrow, November 9, 2012, retrieved November 12, 2012. ↑ Web. City to jumpstart West Main improvements, Sean Tubbs, Charlottesville Tomorrow, February 24, 2013, retrieved October 27, 2014. ↑ 6.0 6.1 Web. West Main church, businesses want their needs considered in study, Sean Tubbs, Charlottesville Tomorrow, May 6, 2014, retrieved October 27, 2014. ↑ Web. http://www.cvilletomorrow.org/news/article/19990-west-main-critique/, Charlottesville Tomorrow, January 21, 2015, retrieved December 20, 2015. ↑ Web. MPO signs off on area transportation funding requests, Sean Tubbs, Charlottesville Tomorrow, September 28, 2016, retrieved October 17, 2016. ↑ Web. Albemarle projects score well in initial steps of VDOT funding process, Sean Tubbs, News Article, Charlottesville Tomorrow, January 17, 2017, retrieved December 15, 2017. ↑ Web. 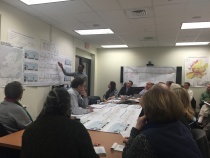 West Main group reviews three concepts for streetscape, Sean Tubbs, News Article, Charlottesville Tomorrow, January 14, 2016, retrieved December 27, 2016. ↑ Web. Charlottesville panel recommends West Main rezoning for third time, Sean Tubbs, News Article, Charlottesville Tomorrow, February 9, 2016, retrieved December 29, 2016. ↑ Web. Charlottesville City Council close to making West Main height change, Sean Tubbs, News Article, Charlottesville Tomorrow, March 8, 2016, retrieved December 31, 2016. ↑ Web. Charlottesville architecture panel gets peek at West Main schematics, Sean Tubbs, News Article, Charlottesville Tomorrow, October 10, 2016, retrieved January 11, 2017. ↑ Web. Council approves schematic design for West Main, Sean Tubbs, News Article, Charlottesville Tomorrow, May 16, 2017, retrieved December 29, 2017. This page was last edited on 9 September 2018, at 23:47.